To be very specific a high number of names came up but they were all variations of the same place which apparently has changed names a few times. Seriously I am very interested in knowing what is great in the less celebrated EAST Greenwich before the gloss of the Lifestyle Quarter (with its posters of slim couples who’s hair always floats in a permanent breeze) sweeps it all away. 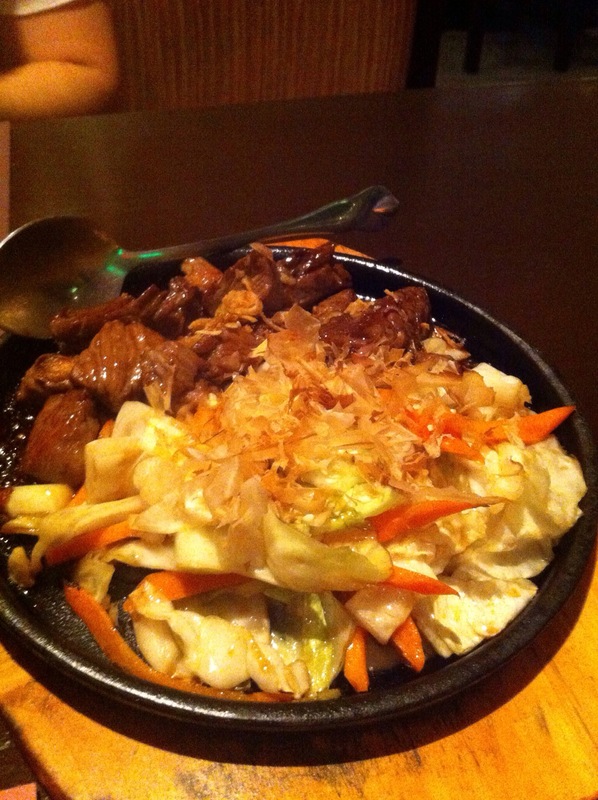 On a corner with a vivid neon sign, it is hard to miss Sensuru. We slipped in and found it very cosy. I’d actually read that it was ‘first date friendly’. Yes, I can guarantee I was sat discretely, but a rather long way from my husband. so I guess it all depends what sort of ‘first dates’ you guys get up to. Service was hilarious. And it’s not often you can say that. Listen, it’s hard to review service. You winge, and you ruin your own night. I winge in blog form, and it gets you and me into a bad mood. And what sort of service is it that we really want went we winge about the existing service? Glossy upbeat antipodean sunshine? Because let’s face it, that goes hand in hand with chain-like, made on the assembly line food and interiors. Just what is it we want? Do we winge about our mates if they make us dinner and it’s a bit late? Admittedly we don’t pay them for the service, but the night isn’t ruined if they mess up the food. Why don’t I start with what I got? 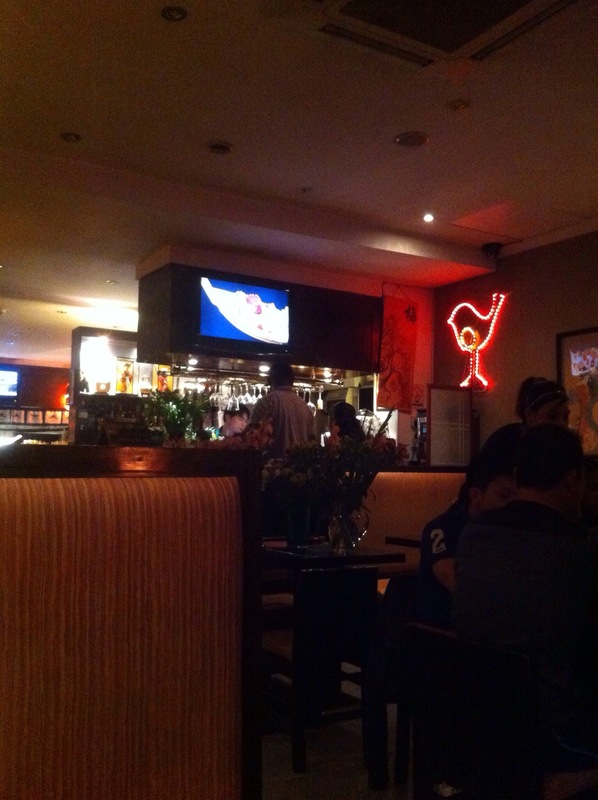 Three offers of drinks in the space of 3 minutes from 3 different waitresses…. Followed very shortly by an older waitress- possibly the manager or owner saying “so you want drinks or not?” whilst removing the drinks menu and having us usher her back because the previous 3 requests had bullied us into making a snap decision: Japanese tea, sake and water. After this rush of attention, the option to order anything evaporated into the ether. In the end we gave up and we approached a waiter at the bar and asked to order. So we sound like troublesome customers? I didn’t feel too bad as we were clearly better behaved than the table behind us, that was getting increasingly irate that the staff could not provide him with an iPhone charger as a side to the teriyaki chicken. Drinks matter to me. Hard or soft stuff. And Japanese restaurants get this right for me. This particular presentation of sake works. That white sphere in the middle is a separate item full of ice. Boring glass though, right? The Japanese tea came in petite ceramic cups. That’s the main reason for ordering Japanese tea, shortly followed by the fact it just makes you feel warm and healthy. We’re still yet to be converted to the concept that we should willingly part cash in exchange for sushi (which is cold and only slightly redeemed by wasabi and pickled ginger). I like to go out for a hot meal, so we rushed to the grills section, and the food boxes, with fried bits as starters. Once you were at the grilled section, there were too many nice sounding sauces and bases to be weighed up against each other. 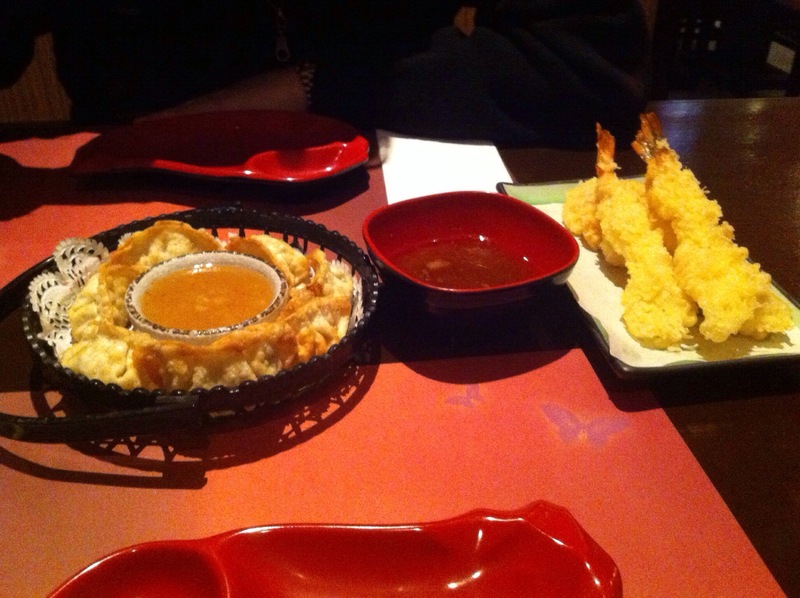 Great tempura bits and nice sauce… Yet again can’t be 100% sure what was within the batter. On occasion prawn, and maybe pumpkin. I am never sure of the motivation behind this combination is cost or err…. health. This recipe can fail with the vegetable making the batter soggy. Here it didn’t. 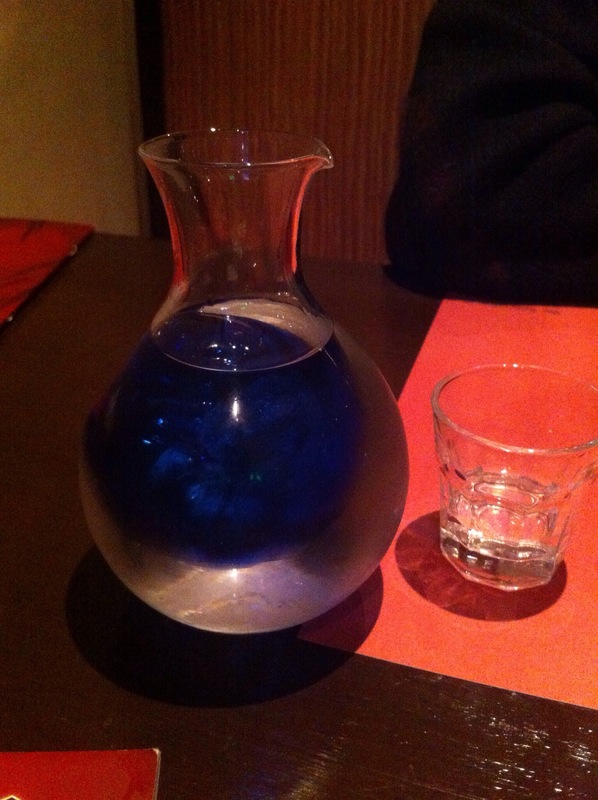 More sake. We were offered a top up of tea too, but the waitress didn’t wait for the answer so I never got it. 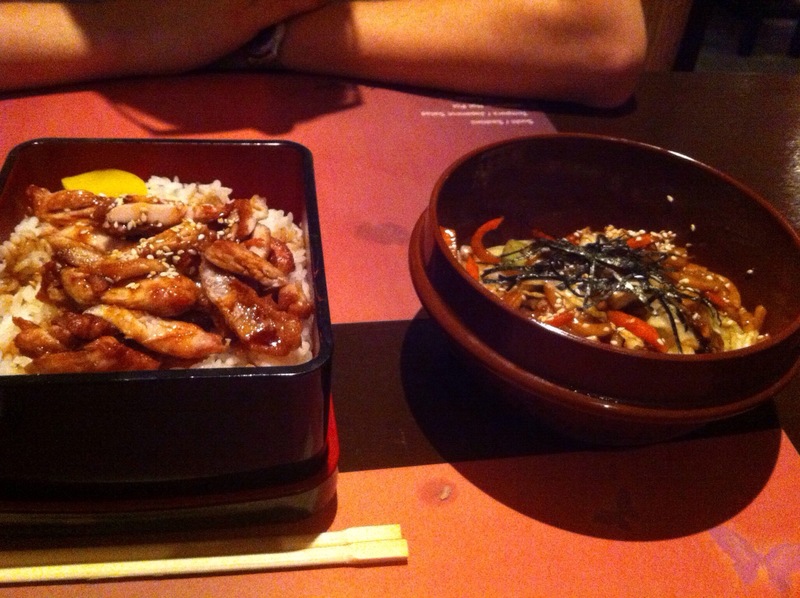 The grilled beef on garlic and spices was so so and the teriyaki chicken box was better. We put them in the middle of the table and ahead to assist In a more equitable distribution of flavour. As you can see, there is a 3rd dish that has totally escaped my memory. You’ll have to judge its merits on its looks. (Not something I would normally advocate – think of kiwi fruit, for instance). To entertain us throughout the meal, we had the widescreen TV presenting pictures of the meals like a catwalk show. No music though. I am disappointed. I suppose it’s hard to decide what music should accompany the dance of the sashimi.